There are a lot of things you may think of when you think of breastfeeding a toddler and boundaries - but is setting boundaries with that toddler one of them? We hit the 18 months of breastfeeding milestone last week and that got me to thinking about how our breastfeeding relationship has changed. We’ve gone from hours of my son being latched to a quick little drive-by - just enough to fuel him up for more playing and exploring. He has also developed “preferences” when it comes to nursing - and I’m not just talking left or right side! L “needs” to have both of mommy’s boobies out at the same time because he likes to hop back and forth when nursing. He also really loves playing with my belly button. Neither of these things make nursing a toddler in public very easy! At the same time, his communication skills have taken off recently and his vocabulary is exploding at a rapid rate (just yesterday he said Minnie and Lambie - this Disney-momma’s heart exploded with excitement by the way!). However, even though his vocabulary is great, and he knows that “num nums” means it’s time to nurse and will even say it at home, he is still adamant that the only way he asks to nurse is by attacking my shirt and trying to rip it off. Again, this makes nursing in public a little - um - awkward?! I can't tell you the number of times he's been sitting in the shopping cart at Target and flipped out trying to rip my shirt off. NOT the right way to ask for Num Nums! So what am I supposed to do in these situations? I’ve always been a nurse on demand kinda momma and I was really struggling with setting boundaries with L when it comes to “num nums.” It all came to a head last weekend when I was at a La Leche League meeting and L wanted to nurse when he saw all the babies eating. He started with the tugging and then insisted I unsnap both sides of my nursing tank. When I wouldn’t he started melting down - like full on freak out! I was a little embarrassed but thankfully I’ve been going to that meeting for 18 months and feel really comfortable with everyone there. One of the leaders, who is also a friend, saw my struggle and asked what was going on. I explained to her that L will only nurse with both breasts out and freaks out if he only gets one side. Plus, he wanted to play with my belly button. I was actually quite frazzled in that moment - I felt the same way I did when he was only a few weeks old and we went to our first meeting to seek help with what was eventually diagnosed as a tongue tie. That leader told me it was okay to set limits and it was okay for him to get upset with it. She said I could tell him "No" to having both breasts out and if he got upset it was okay. That was a very freeing moment for me. I’d never want to deny my child food, but he’s getting to the age where he can understand waiting - and at 18 months I know my child won’t starve if he refuses one nursing session because he doesn’t like the conditions. 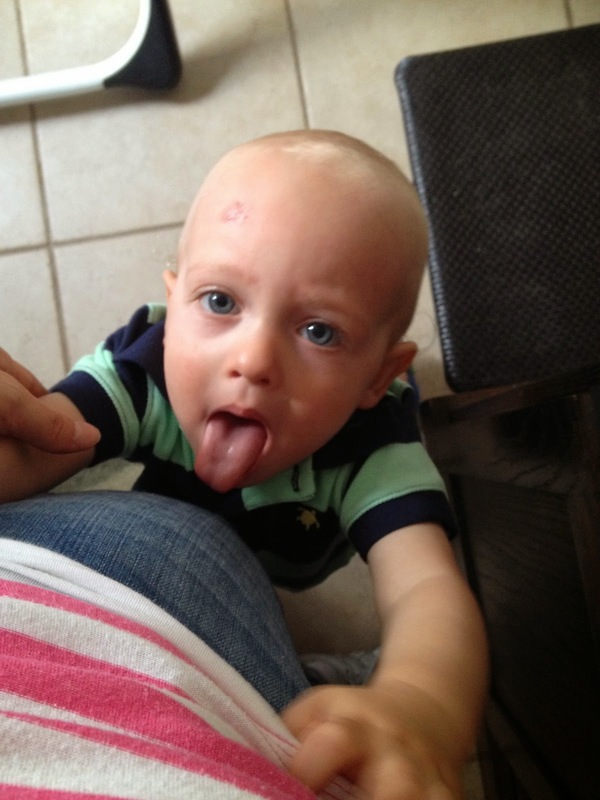 He’s also at the age where I can starting teaching him that we ask for “num nums” instead of attacking mommy’s clothes. I’m not saying that I’d ever deny him food if he doesn’t ask instead of grabbing but I do try and stop him from grabbing and instead use the words I’d like him to use in the future. Is this really any different from teaching him other life lessons - like the stove is hot or using caution when climbing up the slide? This is all still very new to me - I hate to think of my son upset because he wants to nurse in a certain way and I’m not letting him, but I know that it’s important to our long-term breastfeeding relationship that I start setting new boundaries now. 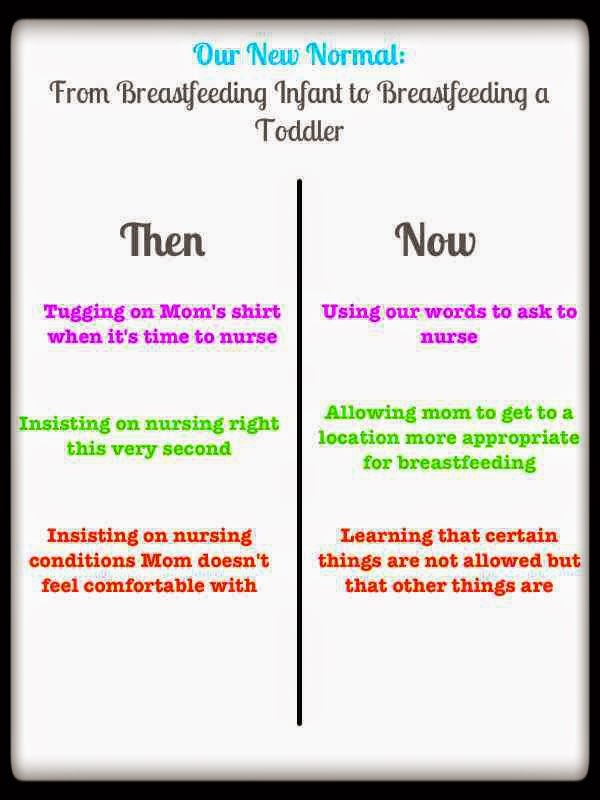 Also, I’m not saying everyone - or even anyone else - needs to set these same boundaries with their little nursling. What I am saying is that the breastfeeding relationship is a two way street and that both of you need to feel comfortable. If you’re nursing an older child it is certainly okay to set small boundaries - ultimately I think they will enhance your relationship as time goes on. This is our "New Normal" chart - what would you add to yours? And don’t forget to take advantage of the amazing support available to breastfeeding mothers - find a local La Leche League meeting or other local group, seek out online support forums or even connect with us on the Adventures in Breastfeeding Facebook page. Extended breastfeeding is less common than most of us would like - it’s sometimes harder to get support or even get your questions answered but help is out there and often crucial a continued breastfeeding relationship. The good old days when nursing looked "easy" and we could still pose for a professional photo session! Have you set boundaries regarding breastfeeding with your older toddler? If so, what were those boundaries and how have they worked out for you? Share your stories in the comments below!